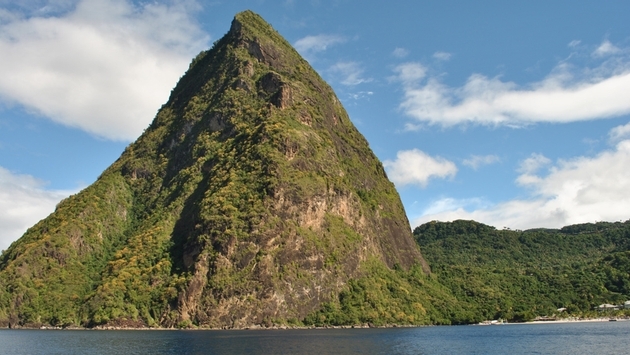 The first image that captures you in St. Lucia is the twin peaks of the Piton Mountains, looming over the emerald hills. It’s a jaw-dropping sight that’s best experienced close-up, from the perspective of a floating catamaran. Stepping onto the rocking deck of Nerve’s Catamaran, I admit that I wasn’t too thrilled about the prospect of swaying back and forth for an hour before we reached the Pitons. But settling into a corner and gazing at the candy-colored houses rising above the gently lapping Caribbean Sea quickly calmed me. A local vendor in a canoe covered in the vivid shades of fresh tropical fruit floated up to sell the morning’s bounty. I selected a large coconut, which he swiftly opened with a swipe of his machete. Sipping on coconut water and being surrounded by crystalline water and paradise-worthy vistas helped the ride to the west coast of St. Lucia glide by. Soon, the pearly sands of Sugar beach, cradling the foot of the Pitons, appeared. The mountains tower from both sides of the beach, with Gros Piton rising to 2,619 feet and Petit Piton topping 2,461 feet. Both peaks are popular for hiking and climbing but after sailing, snorkeling offers a great way to see the island from another perspective. Strapping on the snorkel equipment and splashing into the clear water, glimpses of angelfish, lionfish, eels and coral float all around. After sailing and snorkeling, a visit to the lush landscape of Diamond Botanical Gardens offered me a chance to experience the island at a more leisurely pace. 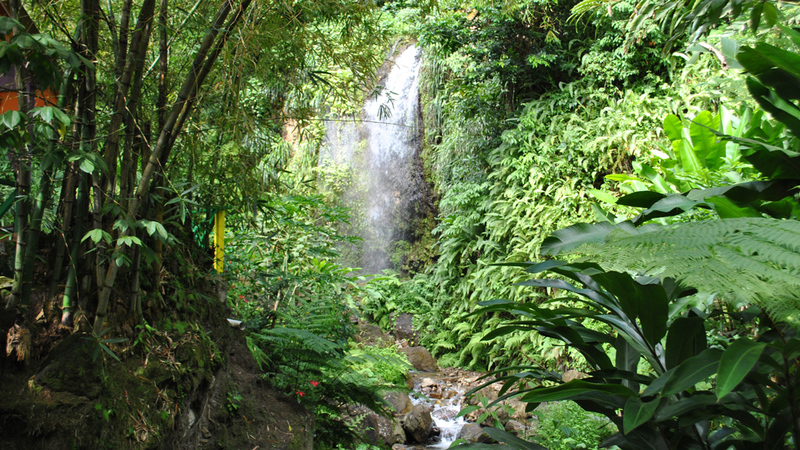 Tucked into the southwest coast of the island, in the charming town of Soufriere, Diamond Falls Botanical Gardens, is a must see. A nature hike thorough the 2,000 aces reveals a myriad of natural treasures, including bold red ginger lilies, which are always in bloom, nutmeg trees bearing pods filled with the spice and cacao trees brimming with fruit for St. Lucia’s chocolate industry. Deep within the gardens, Diamond Waterfall cascades over yellow and purple tinged rocks encrusted with minerals. Nearby natural spring mineral baths, where a young Josephine Bonaporte reportedly bathed when her father owned a neighboring plantation, bubble over with mud and sulfur. For a small fee, locals and visitors soak in the baths for skin and health rejuvenation. Further up from the gardens, the strong sulfur odor of La Soufriere, the world’s only drive-through volcano, wafts through the area. You don’t really drive through the entire volcano, but up a hill and through the crater, to a few hundred feet from the gurgling, smelly structure. From there, you climb up to the dormant volcano, which still spouts poufs of steam and mud, and a guide explains its fascinating history. Walking into a volcano crater doesn’t sound like a typical island experience but St. Lucia isn’t a typical island.